The red planet Mars and a bright star are teaming up in Juneto offer a colorful show in the night sky for amateur astronomers. For the first few weeks of June, Marsand the star Regulus will appear to move closer together, making them a goodtarget for skywatchers graced with clear weather and good viewing positions. For comparison, a clenched fist held up at arm's lengthwould cover about 10 degrees of arc in the sky. The brightness of an object inthe night sky is measured as its magnitude. In the magnitude scale, a magnitude1 star like Regulus would be 100 times brighter than a magnitude 5 star. From June 2 to 10, Mars and Regulusare within just 2.5 degrees of each other. The cosmic rendezvous is known as aconjunction — the name for when two objects in the night sky appear to be veryclose to each other. The conjunction and appulse — which means the point of leastseparation — will occur on June 6, with Mars scraping within 0.8 degrees ofRegulus. On that evening, Mars will shine just above to the right of the star. On the following evening the planet and star will be notquite as close, but Mars will have shifted to a position about 0.9 degreesdirectly above Regulus. Mars will shine at magnitude 1.2, so it should lookever so slightly brighter than Regulus at magnitude 1.34. With the naked eye, and especially binoculars, you can seehow greatly the contrasting colors of golden-orange Mars and slightlyblue-tinged Regulus are accentuated by the two objects appearing so close toeach other. In a small telescope, Mars looks little more like a staritself. With an apparent diameter of less than 6 arc seconds it's hardly biggerthan Uranus. Currently, Mars is continuing to recede away from Earth itorbits the sun. When it was opposite to the sun in the sky in late January, itshined at a dazzling magnitude -1.3, nearly as bright as Sirius — the brighteststar in the night sky. At the time, Mars was moving rapidly to thewest against the dim stars of Cancer, the Crab. ? On March 10, the mutual motions around the sun of Earth andMars had Earth moving directly away from the red planet. So it appeared to bestanding still against the star background and fading in brightness. It thenbegan its normal eastward motion and is now rapidly crossing before the starsof Leo, the Lion. And yet, despite its fade-down, it will be interesting towatch the motion of Mars as it moves through Leo's familiar sickle and trianglestar pattern. Its movement is fast enough to be noticeable from week to week,if not from day to day. On the evenings of June 16 and 17, a lovely crescent moonwill be sliding to the south of the widening Mars-Regulus duo. ? During the balance of June, Mars will continue to slide eastthrough Leo. Another easy comparison of its movement with background stars iswith the triangle marking Leo's hindquarters. The second-magnitude star Denebola marks Leo's tail. Marswill pass well south of Denebola on July 23, then will pass to the south ofanother planet — Saturn— on Aug. 1. Then, as the summer wanes, it will pass two degrees north of thefirst-magnitude star, Spica of Virgo on Sep. 4. 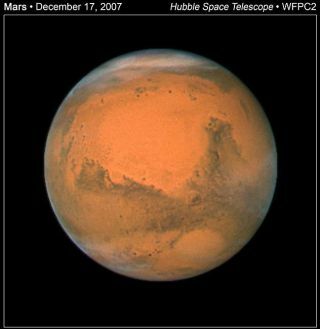 By then, Mars, which was so dazzling when 2010 began, willhave faded to magnitude 1.5. It will appear only 1/13 as bright as it did inlate January, its distance from Earth having increased to 201 million miles(322 million kilometers).